Ever wondered why tubby, balding Hannibal Lecter became partial to feeding on human flesh? Me neither but author Thomas Harris went and wrote a bleeding book about it anyway. 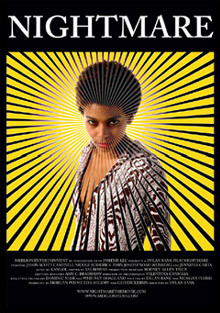 Rather than enthral us with his usual complex plotting Harris has authored, and in turn scripted for the big screen, a lacklustre tale of revenge where the young Hannibal avenges his doe-eyed and unbearably cute younger sister Mischa’s eating at the hands (and mouths) of ravenous soldiers during the Second World War. After making the visually arresting Girl with a Pearl Earring, which helped elevate Scarlett ‘The Lips’ Johansson to ‘It’ girl status, director Peter Webber manages to make Thomas Harris’ rather bog-standard screenplay fill up the big screen canvas with terrific gothic production design and effective lighting. What he is unable to do though is breathe life into source material that was less Hannibal Rising than Hannibal Flatlining. Did film fans really want to know why Hannibal became the monster we all know and love him as? You could ask a similar question in relation to the forthcoming Rob Zombie take on John Carpenter’s Halloween – which explains of Michael Myers’ bonkers personality or last year’s The Texas Chainsaw Massacre: The Beginning which showed that Leatherface wouldn’t have hacked any pretty young things if he hadn’t had been born a freak. Do we really want to know how our favourite big screen ghouls made that leap to psycho supreme? Only if it is done well and is consistent with the previous movies, this latter point being an area that Hannibal Rising is lacking. When most audiences first met Lecter in 1991’s The Silence of the Lambs we were told of how Lecter attacked a nurse and ate out her tongue and of how he dined on a census taker that once tried to test him. There is no indication that these were bad people, just victims of Lecter’s carnivorous leanings. Yet along the way as Lecter built up a rapport with audiences it appeared that he wasn’t some vicious monster at all and in fact he was just a misunderstood psycho that rid society of BAD people. Yeah, right! And since when did Hannibal lose that facial indent that is so striking on the oval cheekless visage of new boy Gaspard Ulliel - or indeed his French accent? In the source material of Thomas Harris’ last book – the badly fudged Hannibal – Lecter had become lovers with Clarice and had in turn made her into a cannibal. When adapted for the big screen this ending was changed (fortunately) meaning that any follow-up to that story strain would be inconsistent to either the resulting film or novel. The only way to go was backwards to keep the franchise alive. This meant naturally that Anthony Hopkins would not be appearing which for the audience robs them of the appeal of watching the Welsh actor deliver another storming performance in his signature role. It also robs them of the main reason to see a Lecter movie. Hannibal Rising is in the hands of an untested lead, the mumbling and rather peculiar looking Gaspard Ulliel. Until now Ulliel was best known as the missing love interest in the excellent A Very Long Engagement which spookily had a cameo appearance from ‘Clarice’ herself Jodie Foster. Its unlikely Ulliel will win viewers over as he fails to have the magnetism Hopkins or indeed Brian Cox had as Lecter’s older incarnations. When the plot demands anger Ulliel’s eyes tear up quite nicely and he has a habit of tilting his head to make use of the extraordinary lighting to convey ‘menace’. Ultimately Ulliel is straitjacketed by the same role that could have made him. In terms of performance Rhys Ifans amuses with his hammy over-the-top villain Grutas – leader of the band of soldiers whom Hannibal is seeking to avenge his sister’s death from – and Kevin McKidd shines yet again in a supporting role which makes you wonder how come he never capitalised on his superb lead turns in both Dog Soldiers and 16 Years of Alcohol. Oddly a lot of the gore happens from afar or off screen which makes a farce of the draw the 18 certificate had for me. Sure people get their cheeks eaten and heads chopped off but it is all done so in such a non-censor threatening manner it’s enough to make this gore-hound wanna cry. The Silence of the Lambs, whilst never overtly grisly, got under the skin enough to make you feel dirtied by the experience. 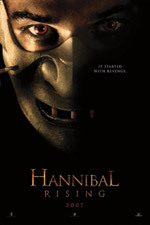 With Hannibal Rising you just feel disappointed and ripped off.